55'' high, 13'' wide tapering to 10.5'', and 11.5'' thick tapering to 9.5''. Stone type: hard brown stone. 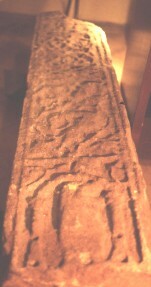 Cross shaft, dated to the mid or late eighth century. This is the south side of the shaft. Collingwood, W.G., , ‘Anglian and Anglo-Danish sculpture in the North Riding of Yorkshire’. In Yorkshire Archaeological Journal (1907) 19, 267-413..